This is a beautifully written fictionalized memoir of the life of the author. The first two books use the the third person point of view “he” distancing the reader as well as the author from the tale. This distancing is a crucial theme. The last book is closer to total fiction continuing Coetzee’s life and persona as seen through the eyes of several acquaintances and a researcher. Born and raised in South Africa as part Afrikaner and part English, John has a hard time figuring out who he is in the post-WW2 South Africa of his boyhood. He left SA after college. South Africa instituted apartheid in 1948, Coetzee was born in 1940. This book seems pretty much like most memoirs except told in the third person. Moving to England to work for computer companies and in math research, Coetzee finds he does not like the South Africa he’s from, doesn’t like IBM, and doesn’t much care for England, including most of the girls. He studies Ford Maddox Ford and wants to become a poet but sees his future as rather bleak. The man has very low self-esteem and puts himself in situations he’s going to fumble. He is very, very smart – his main claim as he sees it – but not as smart as the others in the math biz. Still in 3rd person. Now a reporter or researcher takes over the narrative, interviewing several figures from Coetzee’s life. Coetzee could be presumed dead, I suppose. These interviewees are fictional as far as I can tell, mostly women, who give their impressions of Coetzee. There is a cousin with whom he was in love, a few mistresses and a male friend. Their impressions of Coetzee are similar to each other and not too far distant from how he sees himself in the first two books. He’s an odd duck, a cold fish, unable to form strong personal attachments. 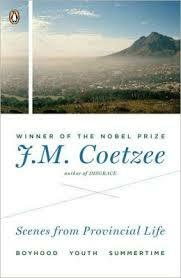 In this book Coetzee has further distanced himself from being the author/subject as well as from the reader. This is very effective in some ways. The last tiny section is made up of bits and pieces from Coetzee’s third person memoir mode again. The end is left deliberately untied – a work in progress? Going back through the book I liked it better. I have enjoyed Elizabeth Costello and Slow Man, both semi-autobiographical novels – or with a very strong Coetzee alter-ego in Costello. He plays with the edges of fiction/non-fiction – authorial voice/narrator voice – but he writes beautifully, catching the human condition from odd angles.